Prescription drugs are contaminating Lake Michigan two miles from Milwaukee’s sewage outfalls, suggesting that the lake is not diluting the compounds as most scientists expected, according to new research. This ability of the drugs to travel and remain at relatively high concentrations means that fish and other aquatic life are exposed, so there could be “some serious near-shore impacts,” said Rebecca Klaper, an associate professor at the University of Wisconsin-Milwaukee. In addition, Milwaukee draws its drinking water from Lake Michigan, although no pharmaceuticals have been detected in the city’s water. The researchers reported that 14 of the chemicals “were found to be of medium or high ecological risk,” and that the concentrations “indicate a significant threat to the health of the Great Lakes.” Nevertheless, it is not clear what, if any, effects the drugs are having on fish and other creatures in Lake Michigan. Prescription drugs are contaminating Lake Michigan two miles from Milwaukee’s sewage outfalls, suggesting that the lake is not diluting the compounds as most researchers expected, according to new research. “In a body of water like the Great Lakes, you’d expect dilution would kick in and decrease concentrations, and that was not the case here,” said Dana Kolpin, a U.S. Geological Survey research hydrologist based in Iowa. It is not clear what, if any, effects the drugs are having on fish and other creatures in Lake Michigan. But this ability to travel and remain at relatively high concentrations means that aquatic life is exposed, so there could be “some serious near-shore impacts,” said Rebecca Klaper, an associate professor at the University of Wisconsin-Milwaukee and senior author of the study published in the journal Chemosphere. In addition, Milwaukee draws its drinking water from Lake Michigan, although no pharmaceuticals have been found in the city’s water, according to Milwaukee Water Works. The scientists tested effluent from two sewage outfalls and water and sediment from Lake Michigan (up to two miles from the outfalls) for 54 chemicals used in pharmaceuticals and personal care products. Twenty-seven chemicals were found in the lake, with four found most frequently: an antidiabetic drug called metformin, caffeine, the antibiotic sulfamethoxazole and triclosan, an antibacterial and antifungal compound found in some soaps, toothpastes and other consumer products. Metformin was detected at the highest levels – up to 840 parts per trillion one mile from the outfalls, and up to 160 parts per trillion two miles away. Of those, triclosan has been the most researched; it has proven acutely toxic to algae and can act as a hormone disruptor in fish. Previous research has linked other pharmaceutical drugs in fish to slower reaction times to predators, altered eating habits and anxiety. There is a lot of research measuring pharmaceuticals in water, so “now we need to figure out what impact they may have,” Kolpin said. “The problem is the effluent and water don’t have one compound but a chemical mixture soup,” Kolpin said. “It’s going to be hard to tease out which of these compounds may do harm” to people or fish. Pharmaceutical and personal care product compounds are found in wastewater around the world. Studies have consistently found prescription drugs in drinking water at parts-per-trillion levels. U.S. Geological Survey scientists sampled 74 waterways used for drinking water in 25 states in 2008 and found 53 had one or more of the three dozen pharmaceuticals they were testing for in their water. The compounds mostly get into sewage through people excreting them. The U.S. Environmental Protection Agency considers pharmaceuticals an “emerging concern,” and has concluded that the chemicals may pose risks to wildlife and humans. There are currently no federal regulations of the compounds in waste or drinking water. However, 12 pharmaceuticals are currently on the EPA’s Contaminant Candidate List, which are chemicals that may require regulation under the Safe Drinking Water Act. “You cannot blame the wastewater plants, they’re not out of compliance and there’s no incentive to start changing their technologies,” Kolpin said. Klaper said the Milwaukee Metropolitan Sewerage District does a much better job than other plants at removing many compounds. But they’re just not equipped to handle the volume. With pharmaceuticals increasingly flowing into plants, capturing the compounds is going to be a challenge for not only Milwaukee but for treatment plants across the country, said Kevin Shafer, executive director of the Milwaukee Metropolitan Sewerage District. “At the time wastewater treatment plants were developed, these compounds were just not an issue,” Shafer said. Shafer and colleagues are researching ways to bolster their pharmaceutical capture, including testing carbon filter technology. Shafer said the carbon filters have a “good response but are very expensive and geared toward lower flows at smaller treatment plants.” The department also has collected 21 tons of unused medicines since 2006 so people don’t flush them down toilets. 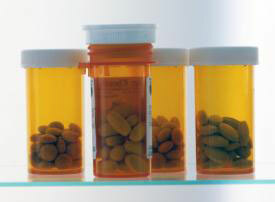 There won’t be a silver bullet to tackle pharmaceuticals in wastewater, said Olga Lyandres, a research manager with the Alliance for the Great Lakes organization. But, with about 40 million people relying on the Great Lakes for drinking water, there needs to be more urgency in keeping these compounds out of the lakes. The new study hopefully will spur awareness of the water cycle in the region, Lyandres said. Article Source: Environmental Health News.